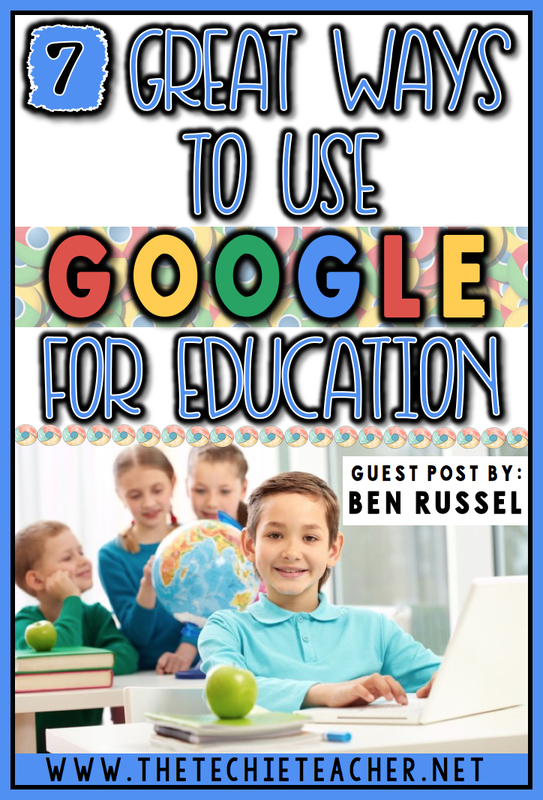 7 Great Ways to Use Google for Education | The Techie Teacher® . The Google Apps for Education services were first introduced ten years ago. They aimed to increase innovation, participation, and creativity among the students and teachers. Since then, Google has worked hard to improve many of their educational products. Google Apps such as Google Hangouts have revolutionized the general view of what an app should do today. Recently, Google has launched a new set of applications called G SUITE for education that seeks to improve the schooling system. Below are some of the educational apps included in the package and how they can be effectively used to improve the education system. Google Scholar is a simple search engine that is designed to explore scholarly and educative material correctly. It is free to use and can be easily accessed by a student, teacher or parent at any given time and location. Students can take advantage of its great features to enrich their literature knowledge. It allows students to search various forms of research material, be it books, journals, articles or other works of literature. It can display links to original books and articles from the libraries. Also, any student can save the acquired material and reference for future usage. Google Classroom is a learning platform for institutions and schools that seek to simplify creating, grading and distribution of school work in a digital way. This program aims to remove the tedious process of learning and also minimize the usage of papers and books used in our classrooms. Google Classroom takes advantage of Google Drive features in creating and distributing schoolwork. Furthermore, it can be paired with Gmail to enhance communication among students, school faculty, and parents. Google Classroom makes it easy for the teachers to plan their schedule and communicate effectively to their students and parents. Communication between students and teachers has never been easier thanks to Gmail. Gmail is among the best, secure, powerful and free mailing clients on the Internet. Most people use Gmail for business purposes, but it can also be used to enhance education. It is a very effective tool to any teacher, student or parent because it offers online storage, device synchronization and email alerts. Schools can use Gmail to easily relay important messages to their students, parents and the school staff. Report cards and school assignments can be easily and quickly submitted through Gmail. Also, as seen above, Gmail can be combined with more Google education apps to improve productivity. Browsing through the Internet looking for one piece of information can be frustrating to most people, but not anymore. Google Alerts is a simple tool that allows one to get notifications and emails on topics of interest. It can be a great tool for students when it comes to working on a theory of knowledge essay, for instance, keeping up with current events and just monitoring anything on the web. Like many of Google apps, this application is free, and it is available to anyone interested. Also, this app can be paired with Google Calendar which is also a great tool for both students as well as teachers. It is more versatile than most other calendars providing different features that enable one to create reminders, organize his/her schedule and also share your events with friends and family. Google Calendar can be synchronized with all of your diverse devices such as smart phones, laptops and tablets; this enables you to keep track of any activity marked in the calendar. It is a nice way to keep yourself on track and meet your goals as planned. Years ago we had no choice but to visit a library if we needed a book, but now things have improved and we have Google Books. Google Books is a book search engine, and it provides searches of full-text, magazines, and books that Google has collected over time, scanned and converted to text. The books are usually furnished by the publishers, authors or through the Google Books Partner program. Google Books is a useful resource for students who do not have access to a library and also to teachers who are planning their lessons, and they need a quick reference. As mentioned above, Google Hangouts is one the most powerful applications. This app offers free video conferencing, voice calls and messaging services. It is freely available to teachers and students. Google Hangouts allows one to communicate with up to ten users at the same time. It also allows remote communication between a teacher and a student; this means that the teacher and the student can be from two different places but still able to communicate and learn. Teachers can help their students on projects, or he or she can pair up students to work on the same project together. Besides, Google Hangouts gives a teacher the freedom of easily inviting guests to give power speaks to the students through video conferencing. • Google Docs – Google Docs is a powerful word processing tool that is built in Google Drive. It gives one an ability to create, edit and save any Word documents online. One does not have to spend a lot of money buying word processors such as Microsoft Word. • Google Slides – Google Slides is more like Microsoft PowerPoint; it gives one an ability to create presentations. • Google Sheets - This is another tool inside Google Drive that provides spreadsheet functionality; it is more like Microsoft Excel. • Google Forms - This is a simple program that allows one to create surveys. A teacher can use this program to evaluate the students’ moral, attitude and skills. As observed above, all these apps have different roles to play; if well utilized by a student, teacher or school in general, they can transform the education system for the better. The advancement of technology has provided new and effective ways of improving our intellectual ability. Many tools are at our disposal and we only have to take advantage of them. Author bio: Ben Russel is a blogger from SolidEssay. He is a generalist and is often invited to share his knowledge on various topics related to education, business, and marketing. Thank you for creating an article that has very useful contents, it gave to knowledge about 7 Great Ways to Use Google for Education and is very creatively formed. I really admire your work and i hope in future i will return for more info. like this one.